Project obstacles and solutions: Citizens Energy Group is updating and renovating the main wastewater treatment plant for the city of Indianapolis. When it is completed, the Southport Advanced Wastewater Treatment Plant will be able to double its capacity. Currently the facility can treat up to 180 million gallons of sewage daily (MGD). When completed, it will handle 360 MGD. This expanded capacity will handle the extra flow from the Deep Rock Tunnel project that keeps raw sewage from being dumped into waterways in heavy rains. Bowen Engineering was selected as the general contractor for the renovation. At the heart of the project is rerouting the flow of water from south to north - opposite of its current flow. This will accommodate a new ultraviolet germicidal irradiation system. The UV system eliminates a chlorination process for controlling bacteria. IMI supplied concrete for the underground infrastructure of the facility and the walls and floors of the UV building. Concrete used in the old chlorination process had to be coated with pitch to keep from being damaged by the chemicals in the water. The facility used a tanker load of liquid chlorine daily. Switching to a UV system to kill bacteria not only is healthier for waterways in the water discharge district, it also helps prolong the life of the new concrete walls and floors. However, long term exposure to water can be just as damaging to concrete as chemicals such as chlorine. When concrete is used under water, it is important to waterproof it so water does not penetrate the pores in the concrete and cause damage. Otherwise the concrete will break down and any steel in the structure will begin to rust. IMI used a crystalline admixture to waterproof the concrete in the walls of the facility. This closes the pores and resists water. It also speeds up construction since there is no need for a secondary application to seal the concrete. 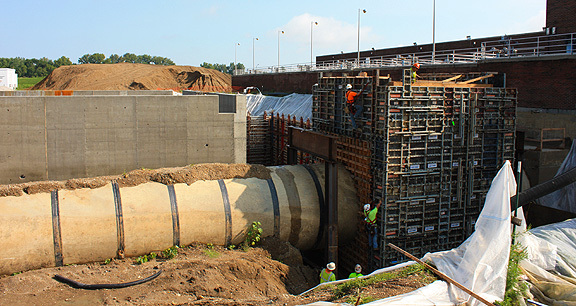 Renovation on the Southport Wastewater Plant is scheduled to be completed in 2017. For more information on waterproofing concrete, contact your IMI sales representative, click here.